The Lenovo Smart Display is a great option for those willing to buy into the hype around Smart Displays. It’s been a long time coming, but Lenovo’s Smart Display has finally hit Australia. First shown off at this year’s CES, the pitch here isn’t all that different from Google’s own Home Hub and Amazon’s Echo Show. Take everything that tech savvy consumers love about smart speakers and augment it via the addition of a display. Rather than play into the audio-centric arms race that’s defined much of the smart speaker category thus far, Lenovo have opted to try and offer something different - albeit at a time when much of their competition is doing the same. Google have just launched their Home Hub, Amazon have finally brought their Echo Show to the Australian market and LG’s Smart Display can’t be far off either. As a result, our overall impressions of the Lenovo Smart Display’s strengths feel diminished by a lack of meaningful differences between it and the alternatives. That being said, if you’re after a Google Assistant-based smart display, this is probably the best one you can buy right now. Though it’s pitched as a direct competitor to Google’s Home Hub, the Lenovo Smart Display looks much closer to one of Amazon’s Echo products than any of the Made by Google hardware out there. Specifically, it looks quite similar to the Echo Show. Thankfully, directly compared against the Show, the Lenovo Smart Display emerges a slightly more-visually striking piece of lifestyle tech. I really dig the bamboo-backed, horizontally-slanted form-factor here. There’s also a little bit more flexibility here in that the Lenovo Smart Display can also be set up either vertically or horizontally. 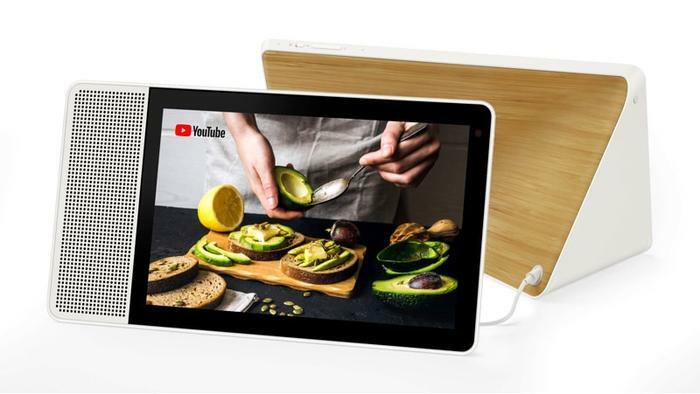 Aside from the screen, the only notable features on the front are the speaker that hangs off the unit’s left-most side and the front-facing camera - which is used for video chat. If you’re not a fan of the webcam, Lenovo have included a physical killswitch. However, using this will curtail some of the ambient-lighting based capabilities of the device - which is either a good or bad thing, depending on how you look at it. On one hand, it limits the basic functionality of the device. On the other, it does provide some additional confidence that the webcam really is off. The inclusion of that front-facing webcam is probably one of the bigger, but also smaller, differences between this and the Google Home Hub. Google are betting that customers aren’t yet comfortable enough with smart speakers and displays to welcome yet another webcam into their home. Lenovo are. Take your pick. Nevertheless, it’s extremely vexing (and honestly a little outrageous) to see tech companies like Lenovo go and put cameras in every device they sell to customers and then leverage the ability to disable those camera as a unique selling point over the competition. Performance - How Does The Lenovo Smart Display Compare To The Competition? Although the on-paper experience is largely synonymous with what you’ll get out of Google’s Home Hub, the real-world performance of the Lenovo Smart Display is better in some ways but worse in others. Compared to the Home Hub, which is a little small for comfort when it comes to watching video content, the Lenovo Smart Display looks gorgeous in action. To our eyes, it’s not quite as sharp but it’s definitely brighter (and larger) than Google’s product. These qualities made it much better for watching video content on Youtube and Twitch. Unfortunately, like the Home Hub, playback from other content streaming like Netflix or Amazon Prime Video is disabled at this time - which is a bit lame. There's still some convenience and utility here. However, the limitations involved mean that this new kind of smart TV is unlikely to replace your existing one anytime soon. The Lenovo Smart Display also features a superior speaker system. When used to either listen to music or as an accompaniment to video content playback, the Lenovo Smart Display sounded much more detailed and louder than Google’s Home Hub - which is currently the only other Assistant-powered smart displays we have available for comparison. As with other smart displays or smart speakers, you get all the usual Google Assistant functionality. You can ask the Lenovo Smart Display questions, tell it to play music, check the weather, set reminders, consult your calendar, listen to news bulletins and interact with both connected smart appliances and compatible third-party services. All the usual boxes offered by the Assistant experience are present and accounted for. If you’ve interacted with one of these speakers before, you know what to expect. If you haven’t, be sure to ask the Assistant for a joke now and then. Of course, like the Home Hub, many of these baseline functions are enhanced and extended by the Lenovo Smart Display’s screen. When you play music, the Lenovo Smart Display will show you the album art. When you ask it for directions, the Lenovo Smart Display will show bring up those directions in Google Maps. When you ask it to help you cook, the Lenovo Smart Display won’t just read you a recipe - it’ll show you it. Read more Which Lenovo Laptop Should I Buy? Unfortunately, and like the Home Hub, the critical flaw here is that the Lenovo Smart Display doesn’t support much video playback beyond Youtube. And even that comes with weird limitations. You can only search with your voice. There’s no form of on-display keyboard. This can sometimes make for a frustrating time if you’re trying to search for a specific video to play. The Google Assistant voice recognition is good but it’s not perfect. If the Assistant gets one word of your search wrong, you’ll have to re-do the whole process. You can’t just modify the search term as you would on a phone. The other weakness here is that interacting with the Lenovo Smart Display doesn’t come across as quite as snappy or responsive as Google’s Home Hub does. The software differences between the two are minimal and minor, but the HomeHub feels just that little bit more immediate when it comes to responding to touch commands. I’m not 100% certain whether this is a software or hardware problem, but it’s definitely a disadvantage I encountered during my time with the Lenovo device. Compared to the other options, the Lenovo Smart Display honestly looks like the best option on the table at the moment. The device’s design doesn’t look as geeky as Google’s own but it’s stylish enough to suit most homes - assuming the larger size is what you’re after. It also picks up where Google leaves off when it comes to sound - and makes for a much better entertainment experience. I wish the software experience was just that little bit smoother. However, aside from that, the Lenovo Smart Display holds up as the smart display to buy right now. Like the Home Hub, it paws at the greater potential of what the category could be but in the meantime, the Lenovo Smart Display is still a great option for those looking to buy into the hype.